NETWORK UPDATE: CHICAGO FIRE lost 0.1 in final numbers, as did the PERSON OF INTEREST rerun, while the rerun of NCIS: NEW ORLEANS gained a tenth. ESPN’s COLLEGE BASKETBALL game eked out a narrow victory on Tuesday cable with 1.01. Below that were the usual Tuesday suspects. BEING MARY JANE (BET) fell 0.17 to 0.96 (lead-in KEYSHIA COLE ALL IN was similarly down 0.14 to 0.42). OWN’s THE HAVES AND HAVE NOTS dropped 0.06 to 0.93. On Bravo, REAL HOUSEWIVES OF BEVERLY HILLS (Bravo) gained 0.06 to 0.80, but the new NEWLYWEDS: THE FIRST YEAR did about the same job at holding that lead-in as GIRLFRIENDS’ GUIDE TO DIVORCE, premiering at 0.31. On TLC, 2 episodes of 19 KIDS AND COUNTING were at 0.71/0.65, down a tenth or more from last week’s half-hours, and lead-out OUR LITTLE FAMILY was down a bit less at 0.38/0.31, with the night’s lead-in 19 KIDS AND COUNTING RECOUNT up a few hundredths to 0.26/0.31. On ABCFamily, PRETTY LITTLE LIARS fell another 0.07 to 0.67, and SWITCHED AT BIRTH dropped 0.06 to 0.34. (In their target Female 12-34 demo, they were at 1.71/0.88.) TOSH.0 (Comedy) slipped 0.04 to 0.66, and THE KROLL SHOW was down a tick to 0.30. At TNT, RIZZOLI & ISLES rose 0.08 to 0.65, and PERCEPTION stayed at 0.31. On MTV, REAL WORLD SKELETONS gained 0.09 to 0.61, and THE CHALLENGE was up 0.03 to 0.50. JUSTIFIED (FX) edged up 0.02 to 0.48. COUGAR TOWN (TBS) lost 0.08 to 0.42. Discovery’s AMISH MAFIA dipped 0.01 to 0.48. 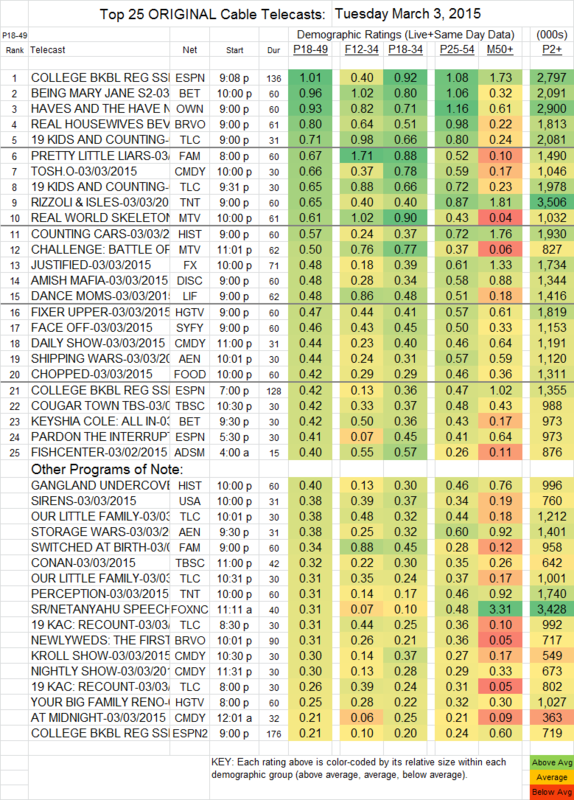 On Lifetime, DANCE MOMS fell 0.04 to 0.48. FISHCENTER (Adult Swim) found 0.40 for its 4AM audience, down 0.03 from last Tuesday. SIRENS (USA) slipped 0.02 to 0.38.